On a glorious warm calm sunny spring afternoon Mods took advantage of the slope in the first half. The home team attacked from the start and after only 4 minutes it took a fine relieving kick from stand off Will Cooper to take play back to half way. Play continued to take place in the visitors half with some strong attacks from Leeds who came near more than once but the defence held them at bay. After 18 minutes 'Ensians were awarded a penalty which took play to half way. Sam Featherstone gained good quick lineout ball which was opened out and a quality pass to Matt Taylor enabled him to power through 4 tackles to score a try between the posts converted by Will Cooper. Not to be outdone Mods made 50 yards with strong running but a fine tackle by Ollie Eaves saved the day. Despite good scrummaging against a heavier pack 'Ensians were up against it and a powerful move by the home team with the ball going from side to side and breaking tackles resulted in a converted try after 30 minutes to even the scores. 'Ensians came back with good lineout ball from Ali Cooper followed by some good phases which took play into the Mods half with James Smith, Chris Westland and Olly Eaves prominent .At the next scrum 10 metres from the line 'Ensians took the ball against the head The home team were driven backwards Will Cooper took the ball back into the forwards who drove powerfully for Ali Campbell returning from a long spell of injury to score an unconverted try making a very satisfactory half time score of 12 points to 7 in favour of the 'Ensians with the benefit of the slope to come in the second half. Talk about a game of two halves .Mods attacked from the start and only fine tackling by Connor Bateman also back from injury and Matt Taylor prevented a score. Will Cooper made a fine break down the slope but lacked support and the chance went begging. After 8 minutes Mods scored a fine 40 metre penalty from a scrum offence. Debutant Doug Elgar came on as a substitute and immediately made his presence felt with a textbook tackle to save a certain try. 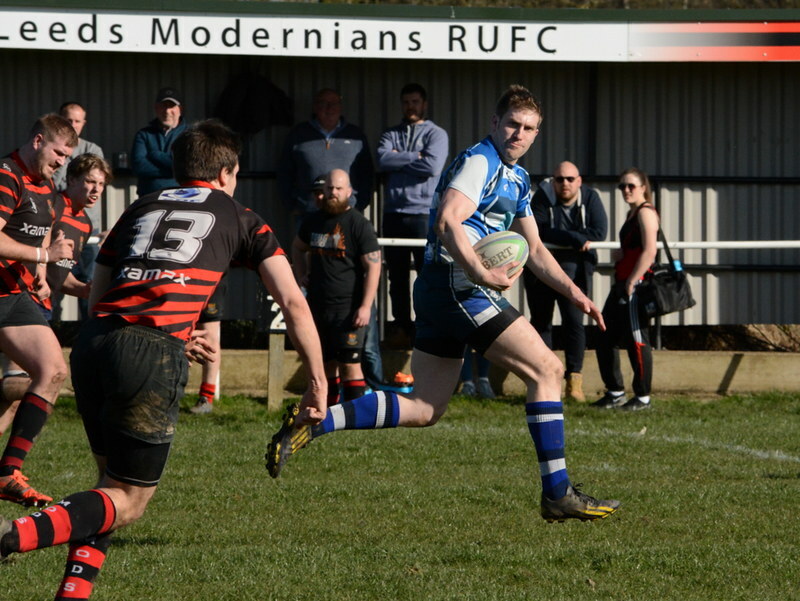 Mods then had a purple patch of 10 minutes scoring a penalty and two converted tries with good strong open play and excellent goal kicking to make the score 27 points to 12 after 23 minutes. To their credit 'Ensians regrouped, their attack pressurising the Mods line for some minutes and coming close on 3 or 4 occasions. However it was not to be and a fly kick by Mods cleared the danger.